When we commonly refer to ‘heart disease’ we mean ‘coronary heart disease’, which happens when blockages build up in the coronary arteries. These blockages are called atherosclerotic plaques and the process by which they build up is called atherosclerosis. This is also called ‘coronary artery disease’. Other forms of heart disease include, valvular heart disease, heart failure, and disorders of heart rhythm. Blockages get worse: As the blockages get larger there is less blood flow to the heart muscle. At one point the heart muscle no longer can get the blood and oxygen it needs. The heart muscle cells then begin to die, and a heart attack occurs. The atherosclerotic plaque cracks: Most heart attacks are caused as a result of ‘cracking’ or ‘rupture’ of the plaque (blockage). The plaque becomes unstable and cracks, forming a blood clot which travels and completely blocks the flow of blood through the artery, and causes a heart attack. Angina is a pain or discomfort that is usually felt in the chest, and spreading to other parts of the body, such as the neck, jaw, shoulders or arms. In some cases discomfort is only felt in these areas and not in the chest at all. The typical presentation of a heart attack is an unpleasant squeezing pain which typically occurs in the middle of the chest or the back. It often radiates to both arms or the throat and jaw, and is accompanied by sweating and / or nausea. This typical presentation does not always occur. Some may just experience heart burn, or ‘stomach upset’ not relieved by antacids or not related to food intake, breathlessness at rest, accompanied by a ‘run down’ feeling. Some may only experience chest ‘pressure’ and not ‘pain’, or pain only in the jaw, teeth or arms. What are the immediate steps to take when there are symptoms of heart attack? Place a tablet of sorbitrate (nitroglycerin) under the tongue. What are the cardiac tests to detect heart disease? 2.Those which indicate a problem with the rhythm of the heart beats. Stress Test / Stress ECG: The stress ECG provides more information than a rest ECG since the oxygen demand on your heart is greater while exercising. A positive stress test indicates that there is reduction in blood supply to the heart. Thallium Stress Test / Nuclear Medicine Stress Test: This stress test is similar to a regular stress test, but in this a dye is injected into the heart and pictures are taken of the heart, before and after the stress test.This can detect areas of the heart muscle that have been damaged by a heart attack and areas that are not getting enough oxygen due to partial blockages of the coronary arteries. Nuclear medicine tests can also provide information on the functioning of the left ventricle. A coronary angiogram is an investigation to detect signs of heart disease such as narrowing of the coronary arteries or damage to the heart valves or muscle. Angioplasty is a method of treating narrowing in the coronary arteries. A special catheter called a ‘balloon catheter’ is used during the angioplasty. This catheter has a balloon near the tip. During angioplasty, the balloon catheter is positioned in the narrowed area of the artery. The balloon is then inflated to open the narrowed area and improve the blood supply to the heart. What is Coronary Artery Stent? A Coronary artery stent is a small spring made up of a fine wire mesh that is placed inside the artery permanently to help keep the blood vessels open. This improves the blood flow and relieves the symptoms caused by the blockage. Over the next month, the cells will form a natural covering which will hold the stent securely in the place. Stents will not rust or move once they are inserted inside the artery. Metal detectors found in airports and appliances such as microwave ovens will not affect the stent or make it move. Magnetic Resonance Imaging (MRI) should be avoided in the first six weeks after stenting. Occasionally some patients develop a re-narrowing within the stent. This kind of narrowing is called ‘In-stent Restenosis’ and is due to a type of scar tissue formation. In fact, ten to twenty percent of patients who have successful stent implantation develop In-stent Restenosis later. This can be reduced drastically by (35%-) use of drug eluting stents. Though these stents are expensive, they help to avoid a second procedure in the future. Can, in special circumstances be used to treat patients unsuitable for surgery. This is a surgery in which a healthy blood vessel (artery) is used to form a detour (bypass) around a blockage in a coronary (heart) artery. The new blood vessel used is called a ‘graft’ and therefore the procedure is correctly termed as ‘Coronary Artery Bypass Graft’ surgery. The original blockage in the artery remains as it is, but now there is adequate blood supply to the heart muscle beyond the blockage. Scientific studies have shown that certain traits and lifestyle habits increase the risk of a heart attack. These danger signs are called “risk factors”. 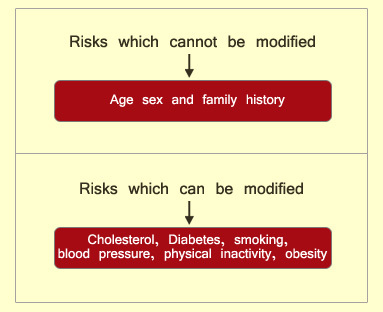 There are two types of risk factors- those which can be modified and those which cannot. Cholesterol is a soft, white, fat-like substance made in the liver and found in your body's cells. Cholesterol is present in foods of animal origin. The combination of cholesterol and protein is known as a lipoprotein. The lipid profile consists of your total cholesterol, triglycerides, LDL, and HDL. LDL is called “bad” cholesterol because it causes atherosclerotic plaque to build up inside your coronary arteries. HDL is called “good” cholesterol because it helps to remove LDL cholesterol from the walls of your coronary arteries. Triglycerides are fatty substances found in the bloodstream. High triglycerides are associated with the build up of blockages inside the coronary arteries. Less than 130 mg/dl (less than 100, if you have heart disease or diabetes). Smoking is the one of the most important preventable causes of premature death. Besides being a risk factor for heart disease and stroke, it also causes several types of cancer. A smoker’s risk of having a heart attack is more than twice that of a nonsmoker. Smoking speeds up the development of plaque in the arteries. It reduces the level of the good HDL cholesterol, and increases the stickiness of blood cells causing blood clots inside the arteries. Smoking even one cigarette has harmful effects. It raises your blood pressure, makes your heart work harder, and increases your risk for blood clots and cause spasm of your coronary arteries. Smoking can also trigger heart rhythm problems, and cause palpitations. The good news is that no matter how long you have smoked in the past, if you quit you will dramatically slow down the build up of blockages in your arteries. Obesity can be defined as an excess of body fat. Obesity increases one's risk of developing conditions such as high blood pressure, diabetes (type 2), heart disease, stroke, gall bladder disease and cancer of the breast, prostate and colon. There are different ways to measure obesity; body mass index (BMI), body fat percentage, waist-hip ratio, and waist circumference. The most widely used clinical measure today is Body Mass Index (BMI). These are risk factors, which you cannot control. The risk of heart disease increases with age. Studies have shown that the risk rises sharply for men after the age of 45 and for women after age 55. Heart disease is not a ‘man’s disease’- women suffer as well, but generally after menopause. If a male in your immediate family has had heart disease before the age of 55 years or if a female family member has had heart disease before the age of 65 years, your risk is increased several fold. An easy way to remember the recommendations is to think of the FITT principle. F- Is for FREQUENCY of training, which should be 4-6 days a week. I - Is for INTENSITY, that is, how hard should you exercise. To obtain maximum cardiovascular benefit, you should exercise between 55-80% of your maximum heart rate. Your maximum heart rate is 220 minus your age. Therefore if you are 25 years old, your maximum heart rate is 195, and you should exercise between 137 and 166 beats per minute, which corresponds to 55 to 90% of your maximum heart rate. The lower end of the heart rate range is for older and de-conditioned people. As your fitness level improves you can start exercising at the higher end of the heart rate range. T – Is for TIME. The recommended time is 20-60 minutes of continuous or intermittent aerobic activity. T – Is for TYPE of exercise. The best type of exercise to develop and maintain cardio-respiratory fitness is aerobic exercise. The term “aerobic exercise”, simply means using oxygen for energy. It is any exercise, which uses large muscles, such as the arm, legs etc., and can be performed continuously. Examples include brisk walking, jogging, cycling, swimming, rowing, and other similar activities. What are the principles of a heart healthy diet? The diet should contain at least 5 servings of fruits and vegetables per day, both as meals and snacks. Fruits and vegetables are high in nutrients and fiber and relatively low in calories, and can be consumed in large quantities. Fruit juices tend to be high in calories and lack fiber, and hence you should eat the fruit rather than have the juice. There are three kinds of fat; saturated mono-unsaturated and poly-unsaturated. Saturated fat raises blood cholesterol more than other forms of fat. Reducing saturated fat to less than 10 percent of calories will help you lower your blood cholesterol level. Oil should be used sparingly for cooking. It is recommended that not more than 1 tbsp (1 tbsp = 3 tsp = 15 ml) be used per person per day. The oil selected should be low in saturated fat and should have a healthy mixture of monounsaturated and polyunsaturated fatty acids. Among the oils, groundnut, soybean, rice bran, mustard and sunflower are recommended. Olive oil is an excellent choice, but it is very expensive and its flavor may not be palatable to everyone. The body makes the cholesterol it requires. In addition, cholesterol is obtained from food. Dietary cholesterol comes only from animal sources such as egg yolks, meat (especially organ meats such as liver), poultry, fish, and milk products. Contrary to popular belief cholesterol is not present in vegetable oils. However, in addition to dietary cholesterol, the saturated fat that you consume is converted to cholesterol in the body, and should therefore be kept to a minimum. Choosing foods with less cholesterol and saturated fat will help lower your blood cholesterol levels.